PA & Live Sound. Made from solid MDF and wooden construction. Carry handle for easy transportation. Video & DSLR Microphones. Mixing Desks. Microphone Accessories. Rode Shockmounts. Rode Microphone Accessories. Manufactured from lightweight ABS material, the protective Protex ABS rack cases utilise a high-density shell with a heavy duty aluminium extrusion to ensure outstanding protection for many years of use. 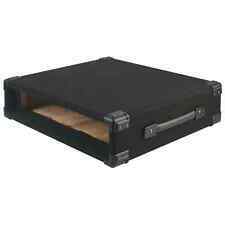 New Chord 4U 19 Inch Rack Case Bag DJ Disco Equipment Wooden Flightcase. Manufactured from lightweight ABS material, the protective Equinox ABS rack cases utilise a high density ABS shell with a heavy duty aluminium extrusion to ensure outstanding protection for many years of use.All models feature a contemporary, professional black textured finish that is easy to clean and maintain. Citronic ABS 19" 6U DJ Rack Trolley Amplifier Amp Flight Carry Case. 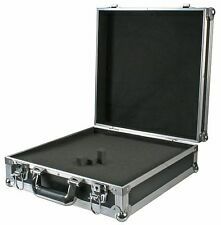 Heavy duty accessory case with foam inlay. Pick and fit pre-cut foam inlay (20 x 20mm). Outside: 380 x 145 x 400 mm. Inside: 350 x 115 x 350 mm. 4U Rack Sleeve - 300mm Deep. - Ideal for install/studio rack sleeve. - Recessed Flip Handles on side. The flight case is designed with removable fronts and backs with butterfly catches for easy access and have indents to prevent them moving whilst stacked. Supplied with M5 rack fixing screws. ABS and aluminium construction. These are the front and rear covers for a 19" SKB rack. These all work fine. COVERS ONLY. Citronic Rack Case Flightcase Mixer 2u 8U. This combo unit is ideal for power amplifier (2U) and mixer (8U). Rack sizes 2U 8U. 2U blanking panel above the amplifier space. Weight 14kg. 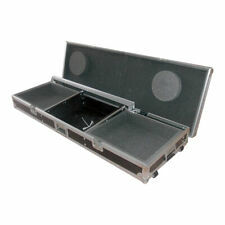 Robust flight case for a mixer and 2 turntables. Ideal for the DJ on the move. 457 x 400 space for CD players or turntables. Mixer space 8U, 19". 1560 x 470 x 240 mm. Complete with handles, corners and castors. This combo unit is ideal for power amplifier (2U) and mixer (8U). 2U blanking panel above the amplifier space. Rear hinged access panel with circular cut-out for the power lead. Fitted with heavy duty flip handles, steel ball corners, butterfly catches with facility for padlocks and large rubber feet. Rack height 4U (176mm). Also fitted with a carrying handle, shoulder strap and zipped outer pocket. Rack mounting depth 328mm. Rack strip front and rear. Zipped external pocket. 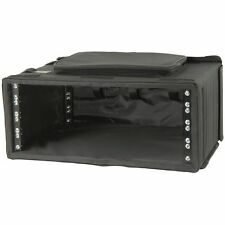 Introducing this fantastic 4U 19" rack sleeve carpet covered case. If you're often out & about with your equipment, unnecessary bumps & scrapes are a constistent issue that you could do without. Rid yourself of the toil & trouble of keeping your equipment safe and secure with this solid 15mm MDF construction 4U rack sleeve for your rack equipment. Use the black carpet covered shell to protect your amplifiers, mixers, equalisers, crossovers, effects units & practically any equipment of a suitable size during mobile & fixed installations. Ideal for mobile DJs, hire companies, mobile PA event holders, studios, touring bands & more. This is an open case with NO front or back covers. 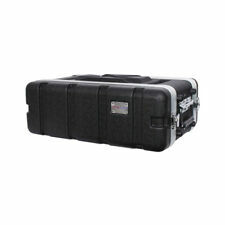 Get your hands on this great product at & even greater price..
Soundlab SP2UD Professional 2U Rack Flight Carry Case Black. Truss accessories. FOGGY - & EFFECT MACHINES. Effect devices / signal processor. Fog and effect machines. Angle rack. Built-in rack rails. Supplied with mounting screws. Mounting width: 483 mm (19 "). Its got a natural wood finish, which is standard ply with hand oiled finish rather than black tolex. Its a beautiful looking case, if you can say such a thing about a flight case. 18 1/4" or 46cm Height (without wheels / Main Aluminum & wood box). Made from solid MDF and wooden construction. PA & Live Sound. Carry handle for easy transportation. Video & DSLR Microphones. Mixing Desks. Microphone Accessories. Rode Shockmounts. Rode Microphone Accessories. 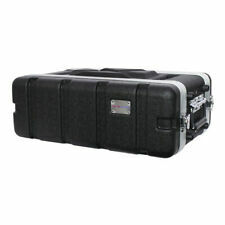 Total Impact Professional 4U Equipment Amplifier Carry Rack Flight Case. These lightly padded 'slip-on' cabinet covers allow you to quickly and effectively cover and protect your cabs during transportation.The cabinet covers are designed in a rugged nylon fabric and include cut-outs for easy access to cabinet handles. Rack Size 3U. Flight Cases. Product features front and back doors released by butterfly catches, rubber feet, steel racking strip, rack bolts with anti scratch washers. Colour Silver. 12 Assorted Matte Colour ABS Guitar Picks (Thickness (mm) 0.58). Rack Size 2U. Flight Cases. 4 Gang Plug-in Switched Extension Socket With Neon Indicators (Artwork version ) kiyafeeney(521). 4 Gang Plug-in Switched Extension Socket With Neon Indicators (Artwork version ) gran102012(390). Truss accessories. Effect devices / signal processor. Angle rack. Rails with 2 Hey mounting possibility for units of the 483 mm (19 "), like light amplifiers, power amplifiers, accessories. Supplied with mounting screws. Power Supplies. Air Conditioners. Active PA Speakers. How do I find the item number or product code?. What if I have not received my order?. Can I reserve item(s) that I intend to buy later?. Need more information?. Truss accessories. Effect devices / signal processor. Angle rack. Rack rails with 4 Hey mounting possibility for units of the 483 mm (19 "), like light amplifiers, power amplifiers, accessories. Rack rails front and rear. Truss accessories. Effect devices / signal processor. Angle rack. Rack rail mounting possibility for units of the 483 mm (19 "), such as light amplifiers, power amplifiers, accessories. Supplied with mounting screws. NJS Short ABS Rack Case (Rack Size 6U). NJS Short ABS Rack Case (Rack Size 4U). Flight Cases. Heavy duty ABS rack case. 60mm deep lid. Squire Sound & Light has decades of experience in the professional audio market. Accu-Case Double Door 2U Rack. - Mounting depth: 44,3 cm. - Screws included. Introducing this fantastic 2U 19" equipment rack. Users will be hard pressed to find a sturdier rack case for their equipment. 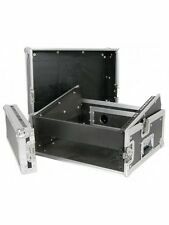 This cases sturdy construction comes wrapped in aluminium profiles and steel corners, assuring maximum protection for your amplifiers, mixers, CD players, midi controllers and more. With two integrated strap handles, users can also enjoy easy-going transportation. Get your hands on this great product at an even greater price..
Truss accessories. Effect devices / signal processor. Angle rack. Rack rails with 8 Hey mounting possibility for units of the 483 mm (19 "), like light amplifiers, power amplifiers, accessories. Rack rails front and rear. Truss accessories. Effect devices / signal processor. Angle rack. Rack rails with 4 Hey mounting possibility for units of the 483 mm (19 "), like light amplifiers, power amplifiers, accessories. Supplied with mounting screws. Authorised Chord Dealer. Fitted with solid handle and shoulder strap. Zip fastening opens fully flat. Mounting width: 483 mm (19 ") Installation height: 270 mm (6 U) Installation depth: 420 mm (90 mm per cover) External dimensions of the corners: 64 mm Weight: 11.5 kg . Truss accessories. Effect devices / signal processor. Angle rack. Rack rail with 10 Hey mounting possibility for units of the 483 mm (19 "), like light amplifiers, power amplifiers, accessories. Rack rails front and rear. Truss accessories. Effect devices / signal processor. Angle rack. Rack rail with 6 Hey mounting possibility for units of the 483 mm (19 "), such as light amplifiers, power amplifiers, accessories. Rack rails front and rear.